-Prepared by Wise Preservation Planning in June 2004. LATEST UPDATE 11/7/07: AFTER 4 YEARS WE HAVE SUCCEEDED!! - A new agreement between THP, Monroe Court HOA, and Judge Augustine has been reached for the sale of the Historic Hunsicker House. The Monroe Court Homeowners Association has approved the sale to Judge Augustine. This sale includes Deed Restrictions that will prevent the house from being torn down. Judge Augustine will be rehabbing and restoring the house consistent with the Historic Property Report the Society had prepared back in 2004. THANK YOU TO ALL WHO HAVE BEEN SUPPORTIVE IN THIS EFFORT! UPDATE 3/29/07: The Monroe Court Homeowners Association invited us to a meeting with TH Properties, Al Augustine, and the homeowners of Monroe Court to present the history of the house and answer any questions the homeowners had on the house and the plans to rehabilitate and preserve the house. Currently the homeowners of Monroe Court are in the process of collecting votes from each of the 149 households on whether or not to sell the property to Judge Albert Augustine. Judge Augustine has agreed to rehabilitate the house under the preservation deed restrictions the SHS prepared. IN ORDER TO GET THE HOUSE PRESERVED & REHABILITATED AS SOON AS POSSIBLE WE NEED THE MONROE COURT HOMEOWNERS TO AGREE TO SELL THE HOUSE TO JUDGE AUGUSTINE. THE SOONER THE SALE TAKES PLACE THE SOONER THE HOUSE CAN BE REHABILITATED. 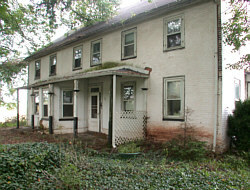 UPDATE 2/10/04: ONE MORE STEP CLOSER TO THE PRESERVATION AND REHABILITATION OF THE ISAAC HUNSICKER HOUSE IN SKIPPACK! - One of our own Skippack Historical Society members and long time Skippack resident, Al Augustine, has agreed to purchase the Isaac Hunsicker house from T.H. Properties. Al Augustine came forward after the previous third party buyer backed out this past September and it really looked like the house would be torn down after almost a year of our efforts. The previous private third party buyer was unable to reach a final agreement with T.H. Properties and the Skippack Historical Society. The agreement of sale with Mr. Augustine for the Historic house contains Preservation Deed Restrictions based on the Historic Structures Report (HSR) the Society commissioned back in June of 2004. The Historic Structures Report (HSR) was prepared by Wise Preservation Planning with the generous financial support of the local business community along with past and present residents. Using the HSR the Society helped craft 10 deed restrictions with the primary restriction preventing the house from being destroyed. 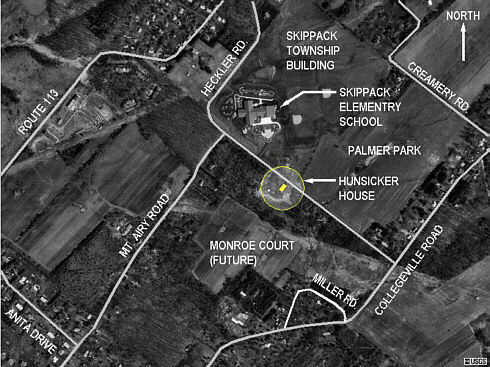 The next step before this agreement can be fully executed is to obtain all of the Skippack Township approvals necessary to make the change in the property lot lines from the original Monroe Court approval. Mark Marino, Chairman of the Board of Supervisors in Skippack Township, and Bill Parkins, Supervisor, have been very helpful and supportive in this effort to prevent the demolition of the farmhouse and the ultimate preservation of the house. 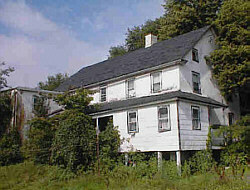 UPDATE 12/31/04: The house is still standing a full year after it was to be demolished. Negotiations on the purchase and rehabilitation of the house continue between THP and a potential third party. UPDATE 6/25/04: Historic Property Report has been completed. 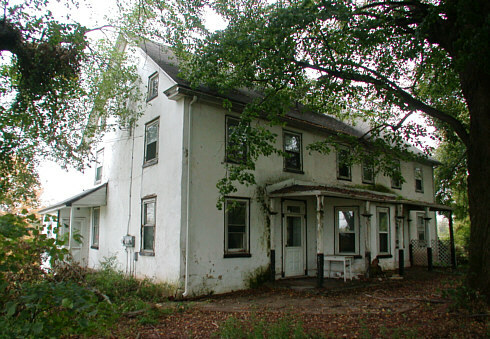 UPDATE 5/11/04: Harleysville National Bank & Trust Company has made a large second donation to the Skippack Historical Society's effort in preserving the Isaac Hunsicker Farmhouse on Heckler Road in Skippack Township. Their donation of $5,000 was presented to the Society at the Skippack Branch Office 50th anniversary party held on May 11 at the bank in the village of Skippack. UPDATE 5/6/04: We will have a table set up at the corner of Store Road and Skippack Pike during the Skippack Spring Feast on May 15 and 16. Come and learn more about the Hunsicker Farmhouse and make a donation for our preservation efforts. We will be selling ice cream to raise funds for the Society. STOP BY FOR A VISIT! UPDATE 4/27/04: ANOTHER SPRING CLEAN UP around the exterior of the farmhouse has been scheduled for SATURDAY, May 1, 2004 starting at 9:00 am. ALL ARE WELCOME! Please park at the Skippack Elementary School or in the Palmer Park parking lot along Heckler Road. UPDATE 4/8/04: A SPRING CLEAN UP around the exterior of the farmhouse has been scheduled for SATURDAY, April 17, 2004 starting at 10:00 am. ALL ARE WELCOME! Please park at the Skippack Elementary School or in the Palmer Park parking lot along Heckler Road. UPDATE 3/26/04: Letter has been sent out to the local businesses requesting support in preparing the Historic Structures Report. CLICK HERE TO VIEW & PRINT THE LETTER. UPDATE 3/18/04: In speaking to one of the previous owners the two Linden trees next to the house may have been saplings from Germany planted by the Hunsickers. Need to research more. Another 1834 date along with names was discovered last week in the basement. They were written into the plaster when it was originally installed. UPDATE 3/12/04: We have begun a fund raising campaign to raise the money required to create an Historic Structures Report. UPDATE 3/11/04: The Hunsicker House Committee has been meeting on a weekly basis to organize and proceed with forming a Historic Preservation Plan. UPDATE 3/8/04: A sign has been put up in front of the Isaac Hunsicker House along side of T.H. Properties Monroe Court sales trailer. UPDATE 2/26/04: In the latest inspection of the house we did find an 1834 date scratched into the plaster on the main chimney support in the basement of the brick house. This would suggest that the main brick section of the house was built in 1834 or before. MORE DETAILED INFORMATION TO COME VERY SOON! UPDATE 2/23/04: After further inspection of the interior, attic, and basement of the house we have been able to narrow the time period of construction down to the early 1800's. It appears that the center brick portion of the house was constructed about a decade before the stone portion (north side) near Heckler Road. The odd shaped southern section of the house may predate the main house but with many alterations over the years it is difficult to conclude it's original date of construction. It appears that a two story addition was added to connect the main brick house to the independent south structure. This separate structure may have been a one and a half story stone summer kitchen built along with the main brick house in the early 1800's. MORE DETAILED INFORMATION TO COME VERY SOON! 1768 - Valentine and Elizabeth Hunsicker sold three parcels of land encompassing 110 acres to their son Isaac Hunsicker. The deed does not mention buildings on any of these three parcels of land. 1809 - Isaac Hunsicker the Elder sold the same three parcels of land mentioned in the deed of 1768 to his son, Isaac Hunsicker the Younger. The description of the property was “All that messuage or tenement and those three contiguous tracts of land,” which indicates that a house was included in the transfer. This information suggests that Isaac Hunsicker the Elder constructed a house during his ownership. Unfortunately, township tax records do not provide the types of information which assist in establishing a date of construction. 1833 - A portion of the house appears to date to this time, based upon an inscription in the plaster and general architectural details such as muntin profiles, nail types, and the ridge construction. However, it is possible that some sections of the house predate this construction and have been heavily modified. The use of cheeked windows in the north and south sections (but not the middle section) suggests that interior remodeling took place in the 1830s or 1840s. 1849 - Isaac and Ann Hunsicker sold a 67-acre, 105 perch parcel of land to their son Isaac C. Hunsicker. This property was part of the 110 acre property mentioned in the deeds of 1768 and 1809. A messuage was mentioned in the deed. 1926 - The Hunsicker House left the ownership of the Hunsickers when Henry G. Hunsicker sold it to Abraham S. Heckler. 1944 - Portions of the farm fields were subdivided from the Hunsicker House following a survey in 1944. Claude F. and Mary Ella Reinford purchased the property containing 51.615 acres of land for $8,250. 1963 - The Hunsicker property was reduced in size again, leaving the house on a tract of 16.0625 acres. Caesar and Savanne Gorski purchased the property and owned it for forty years. 2003 - The Gorski's sold the Hunsicker House to T.H. Properties for a residential subdivision. Valentine Hunsicker was an early settler to Skippack. About the year 1720, he arrived to help with the construction of the Mennonite meetinghouse, working with his stone-mason uncle, Henry Klemmer. Afterwards, he continued working in Skippack. Being industrious, he saved enough to buy 125 acres, then added 100 acres more. This land was owned by Solomon Dubois who bought 500 acres in 1716. It is not known if he actually settled here. The land was located along Heckler Rd., south side, and both sides of Mt. Airy Rd. where two other Hunsicker family houses are located. At close view of the exterior, this very large farmhouse was constructed in two different campaigns resulting in a stone section and brick section. A portion of brick is exposed, showing its coloring and deterioration. The brick is obviously very old. A Skippack brickyard was in operation until the 1840's, according to Heckler. 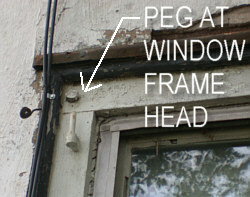 The windows all appear to have frames joined by wood pegs. There are two recessed doorways on the western facade, the depth is less into the brick addition. Both doorways have beveled wood paneling, with a transom above, and decorative exterior trim on the door-frame. The brick addition has a bay window, on the first floor. The stone portion (north side) has two windows and a door, making it somewhat narrow. The depth, running parallel to Heckler Rd., appears to be approximately twice the width, making it one room wide, and two rooms deep. In this photo you can see two different sections of the house built at different times. The section closest to Heckler Road on the left is a stone structure and the section on the right is a brick structure. From research of the above mentioned publication, Valentine's son, Isaac (# 3), was born September 28, 1738, and died February 23, 1828. He was married to Barbara F. Greder (Grater) on November 5, 1761. It is said that he was an ordained deacon at the (lower) Skippack meetinghouse and "he was born, lived, and died in Skippack, as a farmer". (p20) The house was probably constructed on the farmstead by his son Isaac for his family and handed down through the family. This was a custom that Valentine followed in passing ownership of the main house to his son Henry (#6). Isaac (#3) and Barbara had 11 children. His youngest child was named Isaac (#4), that married Magdalena Cassel on February 28, 1803, and had 8 children. Through the valuable notes of historian Abraham C. Hunsicker, we can report more information of the lineage of Isaac. His son Isaac (#4), birth date unknown, died on February 3, 1869. A son of Isaac and Magdalena was named Isaac C. (#5), born October 3, 1819 and died December 15, 1895. Also listed as "Isaac, Jr., farmer", he married Mary Garges. They had 5 children; 3 died young except for sons John G. (born June 4, 1850) and Henry G. Hunsicker (born February 10, 1855). Abraham C. Hunsicker indicates, Henry G., great-great-grandson of Valentine, married Elizabeth Croll. They are buried in the cemetery of the Lower Skippack Mennonite that the family strengthened and served so many years. The maps of 1871 and 1877 both indicate "I. Hunsicker" as owner. The map of 1893 shows "H.G. Hunsicker" as owner. Furthermore, Isaac Hunsicker (1738-1828) "began signing the Skippack alms audits in 1764; and was the treasurer, 1785-1821." This by author John C. Wenger, "History of the Mennonites of the Franconia Conference", 1937, p 271. An owner in the early 1900's was Abe Heckler, remembers longtime resident Rev. Wilmer Reinford. He mentioned that the road was named after Abe. CLICK HERE TO LEARN MORE ABOUT THE HUNSICKER FAMILY AND 170 YEARS OF HISTORY IN THE SKIPPACK REGION. A letter to the Governor Shapp of Pennsylvania, dated 4/10/72, from the Historical Committee of the Mennonite Church of America is written regarding the Skippack Valley. It states that the area is "looked upon by all Mennonites, in the State of Pa. and way beyond the state, as the historic cradle of American-Mennonite culture ... Mennonites and many others look up to (it) as a very highly-treasured historical area".